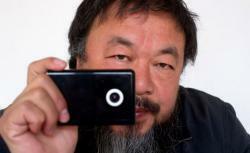 Ai Weiwei on what it’s like to live under constant surveillance by the Chinese government. Photograph by Ed Jones/AFP/Getty Images. Ai Weiwei’s walled compound in Caochangdi Village feels like an oasis amid the choking smog of Beijing. Ivy-covered walls and stands of bamboo provide a sanctuary for birds. Assistants, miscellaneous supporters, and Ai’s dog wander back and forth between the artist’s studio and his residence across the courtyard. But the feeling of serenity is somewhat illusory. Outside the turquoise gate, a windowless van constantly monitors what happens inside. Over tea in the garden, Ai points up at one of the cameras installed by state security during his 81-day detention last year that watch down on him at all times. Below are two excerpts of the conversation we had when I visited Ai on May 14. The video was filmed spontaneously on an iPad, on a breezy day, so not all of it came out intelligibly. After we had talked for a few minutes, Ai went inside his studio to get his friend Larry Warsh, who is one of the creators of the new documentary Ai Weiwei: Never Sorry, which won the Special Jury Prize at the 2012 Sundance Film Festival. We were also joined by an interpreter, though Ai, who lived in New York City in the late 1980s, preferred to speak in English. Ai sees free expression as the core of his current work, much of it taking the form of his Twitter posts. In the first excerpt from our interview, he talks about the explosion of political dialogue on Weibo, the hugely popular Chinese form of micro-blogging, which can be understood as Twitter with 140 words instead of 140 characters, and with the addition of commenting. He isn’t allowed to post on Weibo but he follows it avidly. Ai also discusses the conditions of his release pending the resolution of trumped-up tax charges—conditions he has largely ignored. In the second clip, Ai talks about how he was drawn into political activism, which only became a focus of his work after he became involved in documenting government corruption following the Sichuan earthquake of 2008. He describes what it’s like to live under round-the-clock observation. And he talks about putting his own surveillance cameras around his home, and how the authorities made him to stop.